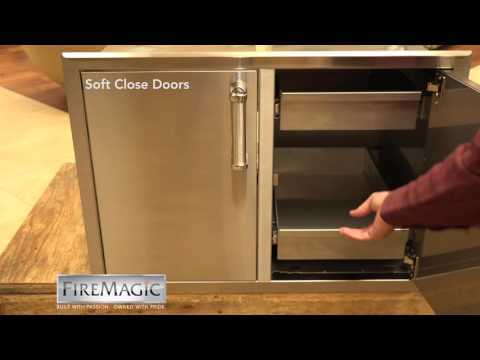 Complete your Fire Magic outdoor kitchen with their line of doors and drawers. The Fire Magic Echelon Flush Mount Double Access Door With Drawers And Trash Bin Storage features sealed, double walled, foam insulated construction for a solid feel. Door hinges and drawer slides are equipped with a soft close feature that not only prevents slamming, but ensures a complete close every time. It comes with stainless steel mounts and a magnetic latch for secure door closure. Fire Magic Premium doors and drawers are made of all 304 stainless steel for lasting durability and are designed to match the Fire Magic Echelon and Aurora series grills. Trash bin not included. Cut Out Width 30 1/2"
30 1/2" 40 1/2" 40 1/2" 40 1/2"
21" 19 3/8" 19 3/8" 19 3/8"
20 1/2" 21" 21" 21"